Christmas and pavlova are an essential combination. On a hot Christmas Day one could be forgiven for forgetting to steam the fruit pudding but you just cannot ignore the luxurious pavlova, with its sweet crunchy meringue crust, marshmallow like centre, topped with clouds of cream, berries and passionfruit. While it is a hugely popular dessert, it is also one that causes many concerns in the kitchen, as without following a few golden rules and a tried and true recipe, things can easily go wrong. However, once a recipe is found and the rules adhered to, making a really good pav is actually quite a doddle. While a pavlova can be a meringue, a meringue is not a pavlova. 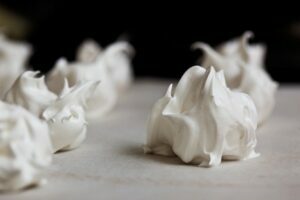 Meringues are much less complicated to make and are generally crisp and dry throughout. 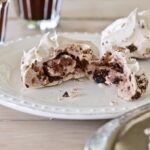 Technically they should not have any chew however a chewy meringue can be really good – see recipe for chewy chocolate meringues below. 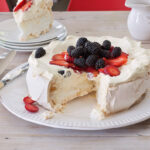 The ideal pavlova generally has a crisp outer shell and soft marshmallow centre. You really do need a cake mixer with a whisk attachment, however a hand held beater will also work, you just need the patience to stand holding it. The bowl should be glass or metal. The mixer and bowl should be scrupulously clean and grease free. The reason for not using a plastic bowl is that grease can stick to this which will stop your egg whites from reaching their maximum volume. Eggs should be at room temperature and when separating take care that no egg yolk makes it into the bowl at all. Very fresh eggs are not ideal as the whites are very thick, as the egg ages the white thins and will create more volume when beaten. 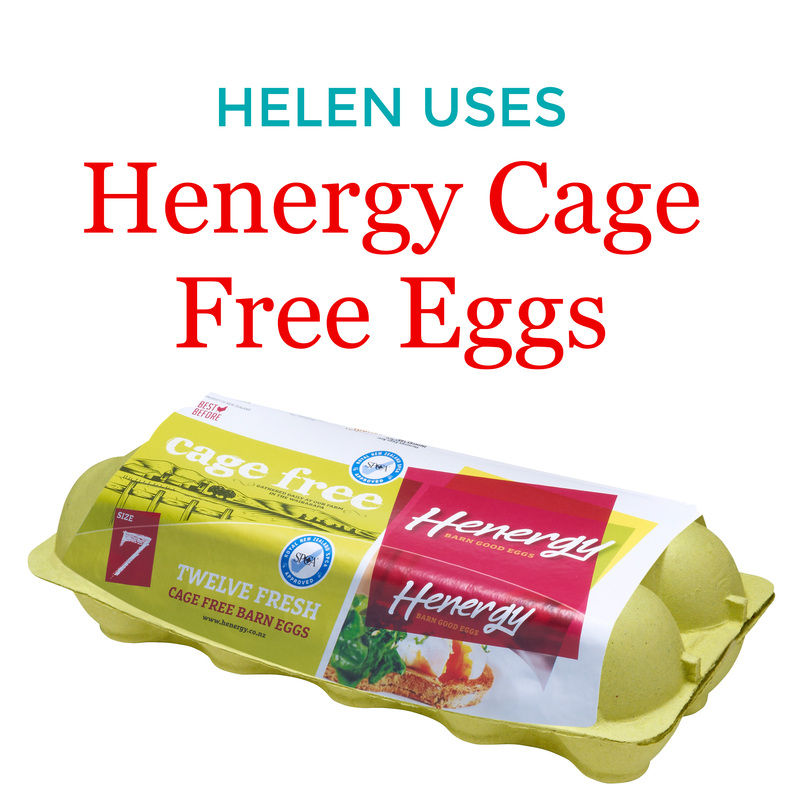 All of the recipes for this feature were tested and photographed using Henergy, SPCA Approved cage free size 7 eggs. Henergy eggs works closely with the Pukaha Mount Bruce forest wildlife restoration programme – Read more. Caster sugar dissolves easier than regular white sugar, however if you don’t have caster sugar on hand then you can whizz regular white sugar in the food processor until it is super fine. The more sugar you use in the recipe the thicker and more brittle the crust will be. Generally the ratio of sugar to egg is 55g of sugar to 1 size 7 egg white. Different recipes have varying stabilisers that help the egg whites to retain their volume and give the desired texture of a marshmallow textured interior and a crisp meringue shell. The addition of acid in a recipe is usual, sometimes a bowl will be rubbed with lemon or lemon juice, otherwise vinegar, lemon juice or cream of tarter will be in the ingredients. A small amount of cornflour is also often used and it is debated as to whether this aids the soft inner texture or just helps to stabilise the egg whites. A tablespoon or more of boiling water is also common. Most recipes call for sugar to be added gradually after the whites are first whisked to soft peaks. However, I have a recipe for perfect pavlova (before you make this one though keep reading on), where everything is added to the bowl and mixed together and as you can read by the comments with it, it really does work out fine. That was my last year’s perfect pavlova but this year’s research of around 10 pavlovas has made me think that I can achieve more volume from the egg whites by adding the sugar slowly. The same recipe with the gradual addition of sugar made a 2 cm difference in height but no discernible difference in texture. While this year I am adding the sugar slowly I wouldn’t hesitate to do the former if time was an issue and I didn’t want to stand spooning in sugar. Whether you add your sugar first or gradually you do need to beat the mixture until the sugar is completely dissolved. 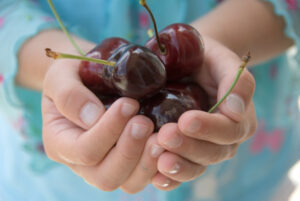 Try rubbing a little mixture between your thumb and fore finger – it should feel smooth with no grains left. While it may then seem logical then that the longer beating the better – not so. Over beaten egg whites will then cause oozing syrup from your pav. Not weeping like an under cooked pavlova but coloured liquid bubbles popping out.from the meringue. I would advise 15 minutes maximum of beating. 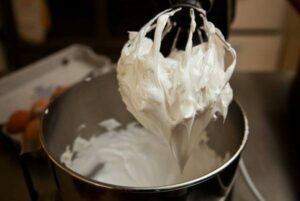 Your mixture should be thick and glossy and form peaks when the beater is lifted from the mixture. This mixture is then piled into a circle on a baking paper lined tray, drawing a ring with pencil around the underside of the paper using a cake pan for guidance is a good way to get a uniform shape. Usually a pavlova recipe will have the addition of vanilla as a flavour. 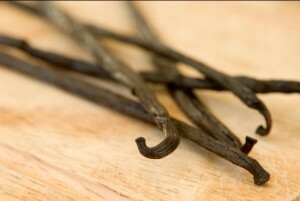 Quality vanilla extract is recommended for a pure flavour such as Heilala Vanilla. Vanilla essence is made with synthetic ingredients. For a pavlova with a differenece freeze dried fruit powders can be used as well as chopped chocolate or nuts. It is best to gently fold through ingredients containing fat (such as chocolate or nuts) at the end of mixing so as not to disturb the volume in the egg whites. 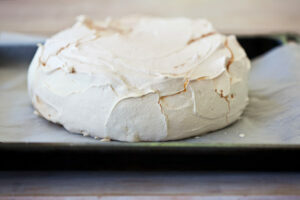 Pavlovas are usually cooked at a long slow temperature and the oven door must not be opened at all! Once the cooking time is finished the pavlova is left to cool in the oven so as not to have any dramatic change in temperature that could cause collapse. Some cooks start their pavlova off briefly at high temperature such as this tried and true recipe from Raewyn. I prefer to cook mine long and slow. Basically the cooking is to remove moisture from the pavlova – to dry it out, I find this is best achieved at 120 C or less. The higher the heat the more chance you have of your shell cracking. 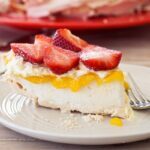 You do need to make sure that your pavlova is thoroughly cooked though as under cooked pavlovas can weep clearish egg white looking liquid from the base. Meringues are much less fuss than a pav but still some cooks fret. Generally they are made with egg white and sugar and need little else although vinegar can help to maintain their shape and volume. I have adopted a cooking method, read somewhere around the internet, of cooking meringues at the slowest of heat e.g 60 C, or as low as your oven goes. I almost ignore them and leave for 4 hours (depending on size) before checking (yes you can open the oven door to check if they are ready). When they are firm and sound hollow when the base is tapped, they are cooked. Wedge a wooden spoon in the oven door to hold it slightly open, turn the oven off and leave the meringues to cool in the oven. The resulting meringues should be crisp and dry. 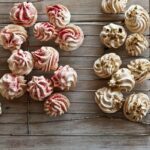 Chewiness is not supposed to be a positive characteristic but if you do like a bit of chew then remove the meringues from the oven before it is completely cold and reduce your cooking time a little. Pavlova and meringues are best stored in an airtight container. Pavlova should be fine for a few days and meringues longer. 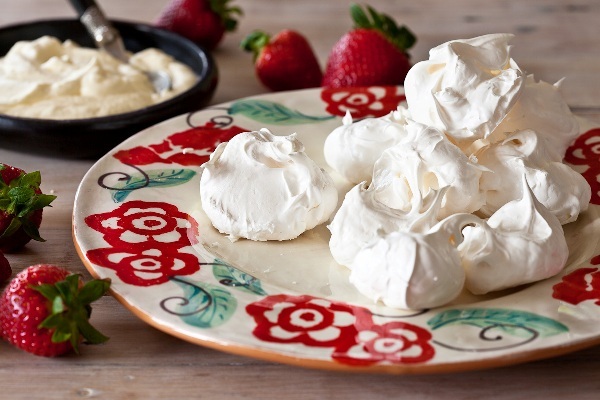 Humidity affects this and it is said that you shouldn’t make pavlova or meringues on a humid day. NB – all of these recipes and photos were created on days of high humidity with no noticeable adverse effects. Preheat oven to 110 C. Place egg whites in the bowl of a mixer (ensuring bowl and whisk are perfectly clean). Whisk until soft peaks form when the beater is lifted from the mixture. Continue to mix, gradually adding sugar at a tablespoon or so at a time and waiting between each addition, add cornflour with last of the sugar. Adding all of the sugar could take 5-6 minutes. Continue to mix until you can’t feel any sugar when a small amount of mixture is rubbed between your index finger and thumb. Lastly add vinegar, vanilla and boiling water and allow to mix a minute more. Using a pencil draw a 24cm circle with a cake pan for guidance on a piece of baking paper. Place the baking paper, pencil side down, on a baking tray. Spoon the meringue into the circle, smoothing the sides. Place the tray in the oven and cook for 1 1/2 hours. Turn the oven off without opening the door and allow to cool for at least 2 hours more or overnight. Invert pavlova onto a serving plate, peel off baking paper and top with whipped cream and fruit. A great way to use up the egg yolks as well. These meringues are classically lovely. Crisp and pretty they are a perfect partner for berries and cream. Technically not how meringues should be but who could resist such a crunchy, chewy chocolate mouthful. Gorgeous alone or partnered with raspberries and cream. Ground nuts, fruit flavours, brown sugar…. variations worth trying. These look so pretty on the plate, almost floating in a pool of coulis. A great way to use up left over merinuges or pavlova shell. This really is my favourite pavlova, crisp thin shell and marshmallow centre. Thank you for this article Helen, and I will be giving your recipe a go. That is extremely interesting about beating for too long….. I have had the coloured liquid bubbles, and obviously beating for too long has been my problem, because I have let it go for a good 20 mins or so. This year have a Kenwood fandangled mixer to try out for my pavlova (previously used a wee hand held), so am looking forward to seeing the results. And it goes without saying the chewy chocolate meringues will be a must try as well. Yes those chewy chocolate meringues are certainly good. Tonight I am making some without the cocoa but with chopped chocolate and freeze dried raspberry powder – I will report back. Thanks for this great article, it has come at the perfect time to try all the recipes and pick a favourite in time for Christmas. Thanks for this article, didn’t know that you could over beat. All the family enjoy Pavlova. Could the recipe be halved for a smaller one … just the two of us? Thanks Helen. The recipe looks very like the one I have made for 40+ years. I also try not to make a pav on a humid day, often difficult in Auckland. I’m about to make my first one from frozen egg whites. I did add jelly crystals once as a flavour – OK but I prefer the ‘plain’ ones. Great recipes for pavs,some a wee bit different! I remember when I was a child, Mums pavlovas always came out perfect and almost pure white. I just can’t seem to get the beautiful white color on mine, they are aways either a pale coffee colour or tend to weep. I have asked her but she can’t remember her exact recipe. Sometimes for my sisters birthday she would tint them the palest pink which looked lovely. Oh well, more experiments required I suppose. 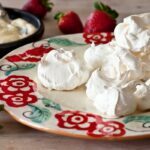 in my experience to get a white looking pavlova you need to cook them on a really low heat – as low as possible and for an extended period of time. Heat will make the sugar caramelise and colour. I think I might have to do a pre xmas pav…just to make sure it passes the taste test…well thats my excuse anyway….beautifull mouthwatering pictures to drool over! Thanks for the tips etc, My pavs were always great, until we moved to a new home which has only a fanbake ! !oven and they turn out Flat?? is this common? or have i lost my touch? of the establishment and product is amazing. until it cooled. Now know not to open oven . Tks for great comments Helen. A handy tip for cooking pavlovas. I have for years put my pavlova mix to cook it, on the plate I am going to serve it on! No need to turn it upside down either. After all, pottery is cooked in a kiln at extremely high temperatures so there is no risk of a serving plate breaking in the oven. Great Tip as they are delicate to move! Yes, there is a definitive answer as to who can lay claim to “owning” the Pavlova. Please refer to “The Pavlova Story: a slice of New Zealand’s culinary history” by Helen Leach, Emeritus Professor of Anthropology at the University of Otago. Professor Leach has a very extensive collection of recipe books whose contents are cross referenced on a huge database. The book was published in 2008 by the Otago University Press ISBN:978 1 877372 57 5 The book also includes several pavlova recipes. Thanks for the info Maria. I did search my shelves to see if I had the book here but can’t see it so must get a copy and read it. I am interested to see the recipes too. Best method I used to use was start the whites beating – sit down and drink a can of beer. Then add sugar and sit down and have another can of beer. After this things were whipped nicely add the other items and throw in the oven. Always use to let cool in the oven overnight as well. These days I just let my partner make them. She thinks she’s pretty good. Ha, I guess success is dependent on how long it takes to drink a can of beer! 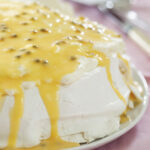 Thanks for explaining in such detail how to make a pavlova as it will be so helpful for first time pavlova makers. 1-1/2 cups sugar, 1-1/2 tsp vinegar. Beat altogether for 10 min. fast speed. Bake 15 min 180 deg. When cooked put tea towel on top. Turn over on to flat surface. Were do you buy freeze dried fruit powder? Thanks for that article. I will be saving this and will read it again before xmas which is the only time of year I make a pav normally. Thank you for all the practical tips and advice. I have never yet made the ‘perfect’ pavlova. Perhaps this Christmas may be a first for me. Great recipes and advice. Very clear and easy to understand. To have definitive explanations and suggestions is fantastic. Will certainly be trying them out over the Festive Season. Thanks so much for such a timely informative spread on Pav! My beautiful Mum passed away just over a year ago and she was the Pav expert – always a Pav on birthdays and Christmas Day… I have had to take over the reins and have had 3 disasters as her recipe was only partially written out as she knew it backwards and inside out! I will be giving your recipe a trial run before Christmas just to reassure myself I CAN do it perfectly! The lemon curd looks like a great way to use up the egg yolks, will certainly be giving it a go.Surprised to learn the you can over beat the whites, probably explains the odd failure! Pavlova have been the bain of my cooking life.I think we all have our favorite things we cook with great success. Mine is lemon honey and shortbread. I will print out all your hints for a successful Pavlova for this Xmas dinner. Can anyone give me a successful Cinnamon Oyster recipe..
thanks for all the testing and sharing, similar to usual recipe except for the water, anxious to try,thanks. Thank you Helen that was all so very informative, I made a pav on Sat that said to put the whites & sugar in a bowl over simmering water until the sugar was melted & then transfer into a beater & beat as per usual. It had a beautiful glossy look, very crunchy, rather sweet but a tart topping would counteract that. I would do it again & it was good to try an alternative. Thanks for the lovely tips, especially the over-beating one. I didn’t realise that one can overbeat it. Will try it out as Pav is our family’s favourite. Thanks Helen for your research into the perfect pav. I have been using your last years perfect pav recipe but have always had trouble with it weeping. Problem now solved. 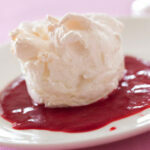 Have just made 3 pavs using this years recipe and not beating to long. They are PERFECT. it’s time to be happy. I have read this post and if I may just I wish to suggest you few interesting things or advice. Perhaps you could write next articles regarding this article. I want to learn even more issues about it! 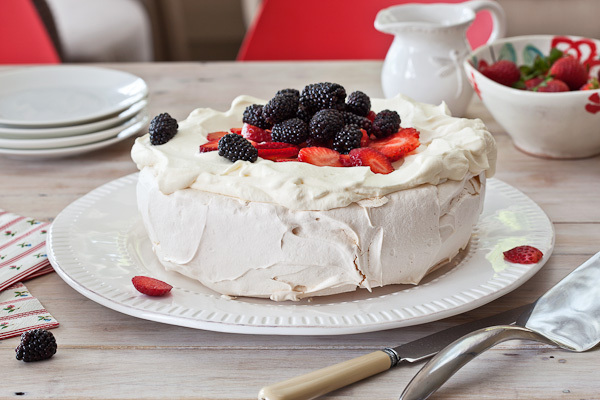 A tip for pavlova makers – I put my mixture straight on to the plate that I am going to serve it on and cook it on that – no need to invert it etc. After all, pottery/crockery etc is cooked in a kiln in excess of 1000 degrees so there is NO chance of one’s plate cracking/breaking in the oven! Cynthia that is such a great tip and one I had never thought of. Certainly saves the angst of hoping the pav will stay in place when transferring it. Hello there. Can i replace sugar water instead of beating caster sugar until it dissolve in the eggs? because i’m afraid the egg would be over beaten. Please can you tell me why my Pavolva collapses, looks fine when cooked and then collapses down why cooling in the oven. Mine did exactly the same!! I used to be more than happy to find this web-site.I wanted to thanks in your time for this glorious learn!! I undoubtedly enjoying every little little bit of it and I’ve you bookmarked to take a look at new stuff you blog post. Australian or New Zealand who cares with this excellent advice from Helen you can make it Yours. I am hosting a High Tea in early January and was hesitant about Tiny Tiny Meringues. I will have a couple of practice runs but know I can now bake with confidence. Hi. I just want to bake it. Could you please tell me for how long we need to cook the pav at 120 degree C? My kenwood mixer has a plastic bowl. Does this mean no good for pavs? Thank you for the wonderful recipe and great explanation! My hubby and I just spent 2 weeks in NZ traveling and visiting family and I’m thrilled that I can now make our newly found fav dessert back home in Canada! It’s like having a little bit of my kiwi fam here with me! Thanks again! Hi there… well I tried your recipe and I have an absolute disaster sitting in my oven. I did everything you said so when I turned it off and went to bed it looked perfect. Now its flat and has no shell… all soft and goey and is going to be a bugger to get off the baking paper. Ive tried other recipes which turned out ok but this one is a real disappointment… how the hell do I resurrect this!! I won’t be trying it again!! Hi Tracey, I am so sorry to hear this and unfortunately aside from Eton Mess there is really no way of resurrecting a pavlova if it is flat. I am trying to think what could have gone wrong. I have made the recipe countless times and sometimes I get a crack but never a sunken mess…. I will think more on it. Hi, thanks for your pavlova recipes! Just wondering if Raewyn’s recipe is meant to have vanilla in it and how much? Thanks! My pavlova turned our soft. I’ve never had this problem before. What did I do wrong. I did everything the same as I usually do. I’m so disappointed. It wasn’t invented in NZ either. It has been proven to come from the US/Uk…. it looks like a lot of it is popping it up all over the internet without my authorization. Do you know any solutions to help reduce content from being ripped off? Hi Helen, thanks for all your tips. I now live in the US but have been able to introduce people over here to the wonderful world of pavlova. Quick question though…I made mini pavs last night & while they turned out ok, my center was more chewy than marshmallow. Any ideas why? I’m wondering if my cornflour & vinegar ratios were a bit off? Or maybe I overbaked them? They were still eatable & people enjoyed them, but I was a little disappointed. Thanks for any help. Akys dziaugiosi skaityti! Nuostabus straipsnis, aciu kad rasote!